Lions are one of the more numerous charismatic carnivores, merely ‘vulnerable’ according to the IUCN Red List. However the real picture, aside from core populations in east Africa, is one of fragmentation. 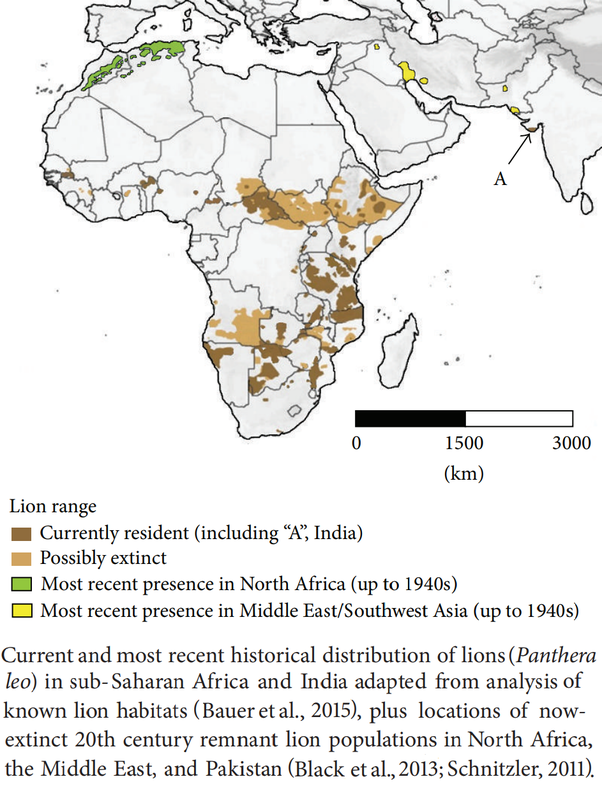 For most of their historic range lions are today only found either in isolated protected areas, the remnants of habitats from their former range (particularly in West Africa, Central Africa and India) or in fenced reserves (Southern Africa). Their history of survival and decline elsewhere suggests this is a very poor situation. We see our surviving African and Indian populations suffering pressures for the last two or three decades but clinging on. This may not be sustainable. In North Africa (Tunisia, Algeria, Morocco) and the Middle East (Syria, Iraq, Iran, Turkey) the same situation held true from the 1880s through to the 1940s (even 1950s). Today few people would associate any of those countries with the lion. Will we say the same about many of its current range states in the next ten or twenty years? Black, SA (2016) “The Challenges and Relevance of Exploring the Genetics of North Africa’s “Barbary Lion” and the Conservation of Putative Descendants in Captivity,” International Journal of Evolutionary Biology, vol. 2016, Article ID 6901892, 9 pages, 2016. https://doi.org/10.1155/2016/6901892. Bauer, H, Chapron, G, Nowell, K. et al., (2015) Lion (Panthera leo) populations are declining rapidly across Africa, except in intensively managed areas. Proceedings of the National Academy of Sciences of the United States of America, 112 (48), pp. 14894–14899. African-Asian lion subgroup: a review. Mammal Review, vol. 41, no. 3, pp. 220–243. This entry was posted in Ecology, Extinction, History on December 19, 2018 by Simon Black.